Turn off power to electrical outlets, then remove outlet covers. Follow all electrical codes and safety procedures. 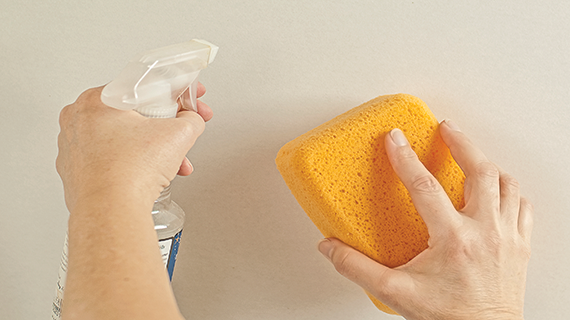 Surface must be free of dust, dirt, loose paint, grease. Use a cleaner appropriate for the surface to be tiled. Be certain surface is dry prior to installing MusselBound. Successful tiling projects start with careful tile layout planning. Arrange (dry fit) your tiles on your work surface in the pattern that is most pleasing and, if desired, requires the fewest tile cuts. 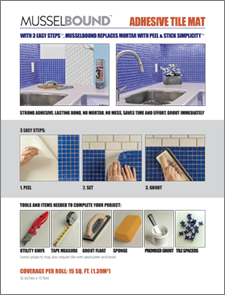 Do not forget to allow space between tiles for grout. Advanced tile layout patterns typically recommend adjusting the layout to avoid using cut tiles that are less than 1/3 the tile width. Seek instruction for advanced tile layout tips. 1. Trim-In-Place on the surface to be tiled: Align MusselBound’s leading edge at top of wall or back of countertop as instructed in 1. PEEL. LIGHTLY press into place. 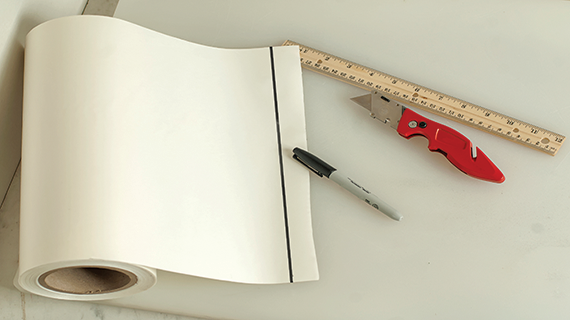 Trim the bottom (and top if necessary) of the sheet to fit with utility knife. 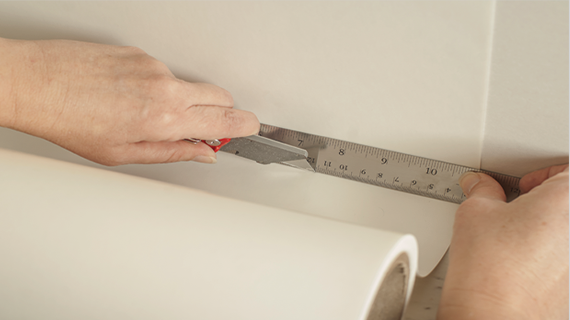 Hold the material to be cut with a straight edge to aid in achieving a clean trim with utility knife. 2. Trim on cutting board: Unroll a length of MusselBound and gently place the adhesive side down onto a clean, cut-safe work surface (cutting board). Measure the vertical length of surface to be tiled and mark the MusselBound release liner side with a felt tip pen. Cut with utility knife to size. Lift MusselBound off cutting surface and install as instructed in 1. PEEL. Become familiar with how easy it is to handle MusselBound Adhesive Tile Mat. 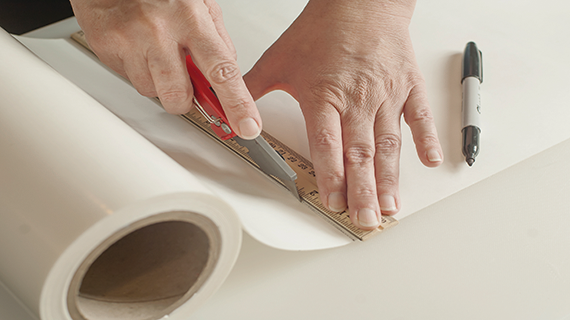 Carefully cut a 1” (25.4mm) wide or less strip from the roll. 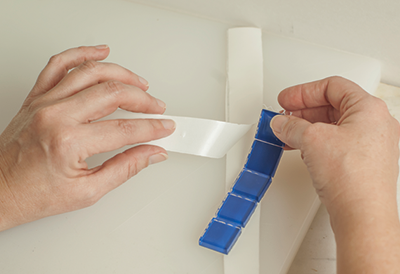 GENTLY place the exposed adhesive side of your sample piece onto an out-of-the-way area of your work surface. Notice that with light pressure, MusselBound may be easily lifted and repositioned. Notice that firm pressure activates the strong bond that will make MusselBound very difficult to lift and reposition. Repeat by applying tile to MusselBound in the same manner in order to become familiar with tile repositionability.